Can Trump And Clinton Transform The Electoral Map? In this week’s politics chat, we entertain crazy/not-so-crazy ideas about where the battleground will be in the 2016 presidential election. (Utah? New Jersey?) The transcript below has been lightly edited. micah: But Julia is stepping in! For your consideration today: Will the battleground map in 2016 be substantially different than it was in 2012? natesilver: Better a pedant than a pundit. And in that spirit, I’d refer people to our distinction between a competitive state and a tipping-point state. Let’s say things go disastrously for Donald Trump and by late October he’s losing to Hillary Clinton by 9 points nationally. At that point, a state like Missouri might become very close. It would be competitive. But it wouldn’t be what we’d call a tipping-point state because its electoral votes would be superfluous for Clinton. Tipping-point states are the ones that push a candidate over the top to 270 electoral votes. harry (Harry Enten, senior political writer): I think the answer is “I don’t know.” We’ve gotten relatively used to a certain set of tipping-point states over the past few elections — Colorado, Ohio, Pennsylvania and Virginia come to mind. But remember that Colorado and Pennsylvania were not close in 2000. And Virginia wasn’t close in 2004. The map can change. julia (Julia Azari, associate political science professor at Marquette University and FiveThirtyEight contributor): One thing that comes to mind when I think of changing battleground maps is the entrance of Virginia and North Carolina to that category in 2008. States that became solidly red during the Bush years have changed due to minority and professional (not mutually exclusive groups, of course) voters. Indiana, Arizona and Georgia are possible candidates for this, too. micah: But I feel like I hear about Arizona and Georgia possibly flipping every election cycle. julia: Yeah, I’m not sure that there’s necessarily solid evidence that they will. natesilver: By historical standards, the map has been incredibly stable for the past five or six election cycles. Yes, there have been some changes — North Carolina becoming more Democratic, Missouri less so — but they’re mostly around the margin. julia: The map is not only stable but not terribly competitive in most states. natesilver: In some ways, though, that may lead people to underrate the amount of rearrangement and re-ordering that could go on. There tend to be bigger shifts when there’s no incumbent running. We didn’t particularly see that in 2008, but it shows up pretty clearly in the historical record. harry: I’m thinking of 1972 vs. 1976 as an example of when the map changed. Yes, there was an incumbent president in Gerald Ford, but he had never been elected. George McGovern’s worst states in 1972 were in the South, but that’s also where many of Jimmy Carter’s best states were in 1976. Obviously, there was something regional going on there with Carter being from the South, but it just shows how much stuff can change. natesilver: What Julia said earlier is important to keep in mind. In the past few cycles, there have been a mere handful of tipping-point states (Ohio, Virginia, Colorado, etc.) and a large number of states that aren’t close to the tipping point. There haven’t been a lot of states in between, by contrast. So maybe what we’d see this cycle is states move from the noncompetitive to the semi-competitive category. Then they might become fully competitive in 2020 or 2024.
micah: So let’s get specific, with Trump vs. Clinton, what states would we expect to experience an unusually large shift — even if they’re just shifting from incredibly safely Republican to comfortably Republican, or blowout for Democrats to comfortably Democratic — and why? harry: I mean the obvious answer here is Utah. Mormons make up the vast majority of the population in that state, and they hate Trump. We’ve already seen polls where Clinton is basically even with him. Four years ago, of course, Utah was the most Republican-leaning state, in part, because Mitt Romney (a Mormon) was running. natesilver: Utah is interesting in that its demographic makeup — the Mormon majority — makes it extremely unique among the 50 states. So if you look at a poll that has Clinton ahead in Kansas, say, we can discount that pretty heavily because Kansas’s demographics aren’t all that distinct from other parts of the country, and if she’s really leading in Kansas we’d probably see her crushing Trump all over the map. Utah, by contrast — there could be something going on with the Mormon population there that’s pretty much isolated to Utah. Although, there are also some Mormons in Nevada and Colorado, enough to make it really hard for Trump to win Nevada in particular. And there are some in Arizona, which could help to put it into play. julia: To speak to the Nevada and Colorado point (and New Mexico as well): I think we’re less likely to see big jumps and more likely to see 2016 as part of a general creep toward a more Democratic Mountain West. The other thing that fascinates me about the West is that third party/unconventional candidates do well there. Ralph Nader got almost 5 percent of the vote in Utah in 2000.
harry: Well, this is a rather interesting question. Colorado is not a state that is heavily Hispanic compared to other states in the region, so I had thought — despite the state creeping towards the Democrats recently — it might be one of the states that trended towards the Republicans this year. But given its white population is fairly well-educated and that Trump polls so poorly among well-educated whites, I don’t think that will happen. micah: I don’t even think of Nevada as a battleground state anymore. Colorado, yes. natesilver: Nevada’s turnout demographics look a lot different in a presidential year and a midterm year. It’s definitely highly competitive in a midterm year. My note of caution about the Mountain West, though, is that while the demographic tides favor the Democrats, Clinton isn’t necessarily an ideal candidate for that set of states. They tend to like outsiders and anti-“establishment” types, as Julia said, and Clinton is neither, although I don’t think Trump’s bluff and bluster quite fits the personality of those states either. So it’s a region where the Libertarian Party nominee, Gary Johnson, could be a big factor, perhaps getting 15 percent of the vote in some of those states. harry: I wouldn’t be shocked if Johnson won in Utah. Both Clinton and Trump are hated there, and Johnson could thread the needle. He’d be the first third-party candidate to win a state since George Wallace in 1968.
natesilver: Mormons are not what usually we’d think of as being libertarian-leaning, though. So it would really have to be a protest vote. julia: Yeah, I could definitely see Johnson as a factor in Western states, including Utah (and maybe even Colorado, not that he’d win it, but he might have an impact). harry: Trump and Clinton’s favorable ratings are around 20 percent in Utah. I think they may be primed for a protest vote there. natesilver: I’d recommend people read McKay Coppins’ article about the Mormon vote. If you squint hard enough, you can imagine how they’d become Democratic-leaning, since they’re both upwardly mobile but also a persecuted minority group. harry: They’re sort of like the Jews, in a way. micah: All right, what other states? How about Georgia? julia: I think you’re right, Micah, that Georgia is kind of like the football and the Democrats are Charlie Brown. natesilver: I, too, am somewhat more skeptical about Georgia than, say, Arizona. Georgia’s sort of competitive viewed from the top down, but there aren’t all that many swing voters there. Instead, you have a very Democratic African-American vote and some very conservative whites. harry: The question in Georgia is whether or not the heavy migration of African-Americans into the state can outpace the movement of whites away from the Democratic Party. natesilver: Right. If Clinton wins Georgia, it’s probably going to be as a result of newly registered voters, newly moved voters and a big ground game. It’ll be about turnout more than persuasion. julia: The thing about Georgia that keeps me coming back to the competitiveness thesis is that so many other states follow that model: big city turns the whole, otherwise pretty conservative state blue. harry: You can see that in this map showing the results from 2014 U.S. Senate campaign in Georgia versus the 2008 Senate campaign (first round, not the runoff) thanks to US Election Atlas. 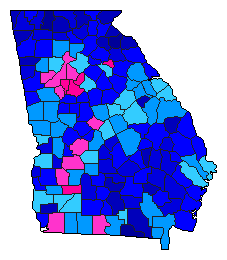 You see how the red/pink (more Democratic) dominates the areas around Atlanta. The rest of the state, for the most part, became more blue (more Republican). micah: Speaking of some of those states, let’s talk about the reverse: usually safe Democratic states that Trump could put in play. There was a poll that found New Jersey tight, no? harry: Yes, by Monmouth University; it found Clinton at 38 percent to Trump’s 34 percent. And remember, New Jersey was a state that George W. Bush tried to put in play in 2004.
natesilver: Yeah, there’s some polling to suggest Trump is overperforming in the Northeast. New Jersey and Connecticut within single digits at a time when he’s trailing Clinton nationally. micah: Why would he outperform a generic Republican there? First, there could simply be regional affinity for a Northeasterner, who really looks and acts the part of the region. Second, it may be that Trump performs best among nonreligious conservatives. The churchgoing voters don’t like him as much, by contrast. So that’s why he might be doing relatively well in New Jersey, but relatively poorly in Kansas and Utah, say. With that said, New Jersey is strongly enough Democratic that Trump could make some gains there and still not be especially close. New Hampshire is interesting to watch, though. Potentially Maine, also. harry: A few thoughts here: First, Bush, after the Sept. 11 attacks, made a big investment in New Jersey and still lost the state by 7 percentage points even as he won nationwide. Second, Maine is a state that was a “competitive” state in 2000. Bush only lost it by 5 percentage points, in part perhaps because of Nader grabbing 6 percent, but don’t be shocked if Johnson does well up there this year. julia: One question I keep coming back to is the state’s affinity for outsider type candidates. That’s a big potential factor in Maine, as Harry said. Not only did they like Nader, but reaching further back, Perot got like 30 percent of the vote there in 1992.
harry: He actually beat Bush in 1992 in the state! julia: They have an independent senator. They also have a Trump-ish governor. micah: Yeah, are there states more disposed to outsiders? natesilver: And yet, Maine seemed like it would be a Trump state in the primaries, but Cruz won the caucus there. It’s not an easy state to pin down, which is why you simultaneously have politicians as diverse as Susan Collins, Paul LePage and Agnus King representing the state. julia: So unlike the West, where they like outsiders but perhaps not Trump-like ones, I think that could be different in a state like Maine for the general election. Micah, to answer your question, yes. micah: We should make a most iconoclastic/outsider ranking of the states. julia: I could do that using 1980, 1992, 1996 and 2000! micah: OK, so we’ve considered the most fanciful scenarios, in which rock-solid Democratic states become competitive, and vice-versa. But what about the more competitive states? Wisconsin, Michigan — the Rust Belt — could Trump outperform there? I’ve heard so. natesilver: You’ve heard so from who? John Barron? julia: Wisconsin, where I’m typing from, is kinda like how we were describing Nevada earlier. harry: Actually, it was John Miller. Trump hasn’t been closer than 9 percentage points to Clinton in a single poll in Wisconsin, including one taken after he won the nomination. micah: And Wisconsin, like Maine, didn’t take kindly to Trump. natesilver: Yeah, I’m in favor of not lumping “the Rust Belt” states together. You could make a pretty good case for Pennsylvania being highly competitive for Trump. I don’t think the case for Wisconsin is nearly as compelling. julia: Wisconsin is not Massachusetts or Vermont, nor is it as politically diverse as Maine. But it’s likely to be a good year for Democrats there, with Russ Feingold mounting a strong challenge to Ron Johnson, who defeated him in 2010.
natesilver: I think the only way Wisconsin is competitive is if Bernie Sanders supporters don’t come home to Clinton. But I don’t think it’s a particularly strong Trump state. It certainly wasn’t in the primaries. julia: Re Bernie supporters: I think you can expect the electorate here to look a bit different than in the primary. The heart of Democratic votes is in majority-minority Milwaukee, where Clinton won in the primary. natesilver: Pennsylvania, on the other hand — the polling has been pretty competitive there, it’s been trending ever-so-slightly red as compared with the national average, and two-thirds of the population there is within the Northeastern sphere of influence, where Trump seems to overperform a bit. Our friend/contributor David Wasserman made the case for Pennsylvania as a good Trump state just recently. harry: The question in Pennsylvania is what happens in the Philadelphia suburbs. There are a lot of well-educated white voters there, and I do think Trump’s lack of appeal to them could end up killing whatever shot he has in the state because those in the western part of the state trended to the right. micah: I was born and raised in the Philly suburbs. julia: Pennsylvania, like Michigan, hasn’t gone red since 1988.
harry: Nobody cares about your story, Micah. micah: All right! To wrap things up: Florida. Could Trump’s horrible numbers among Hispanic voters basically take Florida off the board? julia: Sometimes when I close my eyes I still see the 2000 map flipping back and forth. micah: That may be a sign you need to step away from politics for a couple days, Julia. julia: It was my first presidential election and very formative. harry: Trump, though, has also done well among nonreligious Republicans, and there are a ton of those in Florida. He absolutely wiped the floor with Marco Rubio in the Florida primary for a reason. micah: Lots of Northeastern transplants too. natesilver: The Hispanic population in Florida has gradually become more like the Hispanic population elsewhere in the country, which is bad news for Republicans, because some of those older Cubans were pretty GOP-leaning. Harry’s right, though, that some of the other demographics in Florida seem decent for Trump. They’re decent for Clinton too, though, who also does relatively well with older voters. Florida might be the anti-Colorado in some ways, a comparatively good fit for both candidates. If you look at the polls in Florida, though — rather than try to extrapolate from the demographics — they suggest that it’s polling right in line with the national average, instead of being a pinch Republican-leaning. In other words, it might be a true tipping-point state this year. harry: Sort of like it was in 2000.
julia: Final thoughts in general: The map we’re working with is the 2004 and 2008 one. Those were two-party elections. This year is just weird enough that regional patterns in third-party candidacies, something that rarely gets much attention, could matter. But perhaps not in tipping-point states. natesilver: Would be sort of ironic if it all comes down to Florida and Pennsylvania (which is sort of the opposite of Florida, usually a pinch blue-leaning) after all. One more thought, though, that I want to record for posterity. We should consider the effects of Trump possibility not really having a ground game at all, and how that might affect things. That’s probably a chat of its own, and the answers aren’t obvious, but it shouldn’t be taken for granted. micah: Final, put-you-on-the-spot question: True/False, the tipping-point state in 2016 will be Ohio, Colorado, Florida or Virginia. harry: The answer will be … Pennsylvania. I base that on gut. julia: My cautious read of electoral map math leads me back to Ohio. natesilver: I’m going to endorse Harry’s pick of Pennsylvania. micah: The Dave Wasserman Theory Of The 2016 Election prevails! Thanks, everyone!